Exactly a week ago the people of Sydney, Australia, awoke to find that their normally deep blue sky had gone bright orange. One resident told a radio reporter for the Australian Broadcasting System that when she first looked out her kitchen skylight that morning, it was as if Armageddon had arrived. What had arrived was the most massive dust storm in nearly a century. A dust cloud nearly a thousand miles long and two-hundred and fifty miles wide engulfed the city in millions of tons of fine red dust from the drought-stricken interior. The city came to a stand-still as health authorities warned residents to stay inside if they fit in one of these categories: those with chronic respiratory illnesses or heart disease, school-aged children, pregnant women and the elderly. Still, newscasts in Australia have shown people out in the orange light, many wearing surgical masks or scarves over their mouths and noses. Conditions are considered hazardous when the air quality index exceeds 200. Sydney recorded a peak level during the dust storm of 4,164. Fire stations and emergency services were flooded with calls from anxious residents who thought there must be a large brush fire burning near the city. This fall’s disaster is eerily similar to one that stunned that nation in February. The worst fires in Australia’s history roared across the state of Victoria, southwest of Sydney, spread by winds in excess of 60 miles per hour, with flames shooting 100 feet into the air, killing 210 people and countless animals, incinerating 2,000 homes and blackening 1,700 square miles of land. It was the worst natural disaster in the country’s history. “Hell and all its fury has visited the good people of Victoria in the last 24 hours,” said Prime Minister Kevin Rudd at the time. 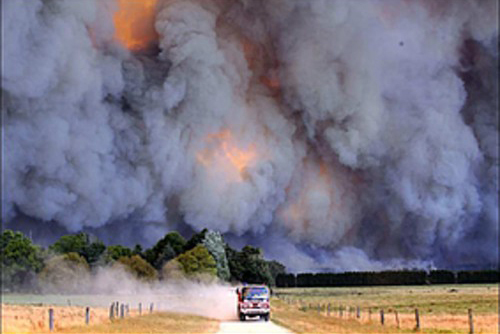 The day the first of the fires started, February 7 (remembered now as Black Saturday), the temperature in nearby Melbourne was 115° F (46°C) — the highest ever recorded there. Scientists are predicting a similar scenario in other parts of the world, including the American Southwest (where I happen to live). We seem to be experiencing some of these same events, only on a far smaller scale, so far. Phoenix dust storm, 2007I watched in awe and horror as the cloud above, a mile high wall of dirt, swept into the valley. Dust storms are a periodic fact of life here in the Sonoran desert. But with record temperatures and declining rain the rule around here, it’s hard to see the terrible images from Australia and not think, selfishly: brace yourself. This week, the Senate is expected to reopen debate on a climate bill — a discussion that had barely gotten under way when the summer season of Mad Hatter tea parties and bizarre town hall shouting matches put it on hold. I’d like to think that a few Senators heard about events in Australia and have been sobered by them. But then I watch members of the upper chamber like James Inhofe (R-OK) on talk shows claiming that we actually need more CO2 in the atmosphere, not less (it helps plants, you see). I await the gavel’s fall and think: brace yourself.